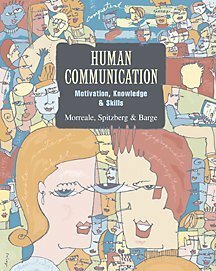 This book offers a unique and unified approach to competence and the basic processes of human communication backed by skill assessment. Beginning with the premise that all forms of communication have the potential to be viewed as competent depending on the context or situation, the text helps readers develop a framework for choosing among communication messages that will allow them to act competently. The theoretically-based and skills-oriented framework emphasizes the basic themes of motivation, knowledge and skills across interpersonal communication, electronically mediated communication, small group communication, and public speaking.